Workforce Connections is Southern Nevada’s Local Workforce Development Board (LWDB). We are responsible for the operation of the One-Stop Delivery System in the Southern Nevada Local Workforce Development Area. Our geographical jurisdiction includes the Southern Nevada counties of Clark, Nye, Lincoln and Esmeralda. 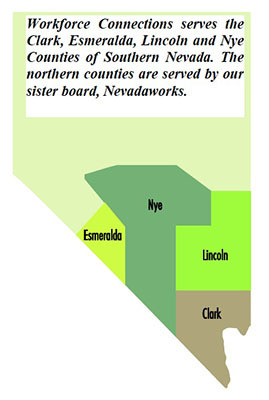 The remaining counties are served by Northern Nevada’s LWDB, Nevadaworks. Our Mission is “Connecting Employers to a Ready Workforce”. We establish dynamic partnerships with employers and the community to connect job seekers to education, job training and employment opportunities. The Workforce Investment Act (WIA) of 1998 established a locally-driven public workforce development system to help job seekers access employment, education, training and support services that help them succeed in the labor market. Local Workforce Development Boards are also called to match employers with the skilled workers they need to compete in the global economy. On July 22, 2014 President Barack Obama signed into law the Workforce Innovation and Opportunity Act (WIOA). The new law is designed to improve and streamline access to federally funded employment, education, training, and support services. Congress passed the law by a wide bipartisan majority; it is the first legislative reform in 15 years of the public workforce system. Every year the key programs that form the pillars of WIOA help tens of millions of job seekers and workers to connect to good jobs and acquire the skills and credentials needed to obtain them. The enactment of WIOA provides opportunity for reforms to ensure the One-Stop Delivery System (also known as the American Job Center Network) is job-driven, responding to the needs of employers and preparing workers for jobs that are available now and in the future. WIOA supersedes WIA and amends the Adult Education and Family Literacy Act, the Wagner-Peyser Act, and the Rehabilitation Act of 1973. In general, WIOA took effect on July 1, 2015, the first full program year after enactment, unless otherwise noted. The U.S. Department of Labor (DOL) continues to issue guidance on the timeframes for implementation of these changes and proposed regulations reflecting the changes in WIOA after enactment.